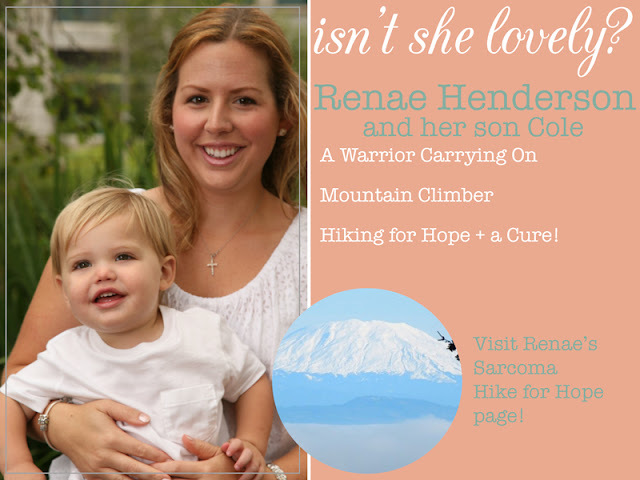 * Mountain Climber ~ Sarcoma Hike for Hope and follow her journey on Facebook! * Super Power ~ To cure cancer, of course! 2) Weleda Calendula Cream - It’s windy and rainy in Portland and this stuff is amazing on sensitive skin. So, it is my pleasure to tell you about Renae. First, I want to say that upon meeting her via Skype I found her to be very relatable and genuine. She could be me, or you, or your best friend. It’s so wonderful to meet people like that. It’s also a strong reminder that cancer doesn’t discriminate based on age, race, or if you are pregnant. Renae’s cancer began when she noticed a lump on the tip of her finger around the eighteen week mark of her pregnancy. 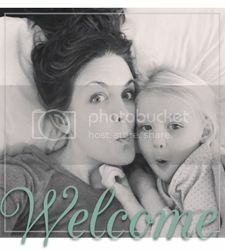 In the whirlwind of being pregnant for the first time and all of the emotions that go into that, this splinter like feeling seemed very insignificant. At her seven month check up she showed it to her doctor. She was told it was a wart that needed to be frozen off and was sent on her merry way. She did just that, but it didn’t go away. Fast forward through others continually telling her it was a wart until January 2013. She has a two year old now and a diagnosis of a very rare form of cancer called epithelioid sarcoma. Sarcomas are an even scarier and more dangerous kind of cancer because they are often misdiagnosed or diagnosed too late. The silver lining for Renae was that she could readily see and feel it. If it had been in her leg or even deeper in her hand it may have been diagnosed much later. Sadly, for this particular kind of sarcoma they don’t do specific research on it because it is so rare. Let’s pause for just a minute. I often think about what a truly bad day would look like. Not in a morbid way, but in a “what would I do” sort of way. Being a young new mom and finding out you have this diagnosis qualifies as the worst of days. Through tough times I have learned to lean on whatever support I can find. So, I asked Renee what areas of her life have provided the biggest level of support from that terrible day forward. Of course, Renae’s family was there for her every step of the way. But, when it comes to cancer the loss of control over your own life is immense. Renae turned to places where she could find others who knew how she felt and what she was going through. Christine actually found a group specifically for people with epithelioid sarcoma on Facebook and shared it with Renae. This level of support and understanding from others in her shoes coupled with the loss of control that comes with a cancer diagnosis became really empowering for Renae. She began planning and training for climbing to the summit of Mt. St. Helen’s as a fundraiser for the Sarcoma Foundation of America, Inc.. Through the Facebook group she met another woman whose sarcoma presented itself not long after her first pregnancy. Through Twitter a twenty five year old man found her because of the hike fundraiser and told her she was the first person he had found with the same type of sarcoma as him. Renae has been able to make connections with others that have really helped her in her fight against cancer. According to Renae, “the Facebook group was so helpful. When you have something this rare finding others who are frankly alive is such a relief. Everything I read was so scary. Everyone who has this dies. This was huge to find people like me”. On February 25th Renae had surgery. While her finger is struggling to heal and “looks like a mess”, she still has it. She is the only person she knows of with this sarcoma on a finger or toe that hasn’t had to have it amputated. She is in the stage called “no evidence of disease”, but there are still major areas of concern. She has to go every four months for a chest CT because typically when it comes back it goes straight to the lungs or lymph nodes. She will be closely monitored for the next ten years. That being said, just within the past couple of days Renae’s finger hasn’t been healing so well. She said, “My finger was healing great, and now suddenly there's an area that isn't and it has this weird very tiny red line... sort of like a blood supply to a tumor situation. It sounds like a possible infection, but I've ruled that out because I have no other symptoms of one. I'm hoping it's just my paranoia. I already have to go back in early June for scans so I'm trying to hold off unless it starts changing or getting worse. This is life with cancer.” Those last few words say so much. There are so many things that happen in life that you can never possibly understand until you live it. My hope in reading this is that, if you haven’t already, you see a side of cancer that is real, everyday life for someone. And then you see that lovely person fighting her way through it. While cancer seems to have defined her life of late, it does not define who she is. Through all of this she is still a mom, wife, daughter, friend, etc. She struggles with having patience as a mother just like all other moms do. But, her favorite part of being a mom right now is seeing life through Cole’s eyes and the immense joy he finds in what seem to be the simplest things. The night I interviewed her they had put in a vegetable garden. She said she felt like watching him do things like play in the dirt became such a constant reminder to slow down and enjoy the little things. Renae has been beyond inspired by those fighting this cancer. Some have lost limbs and have gone through unimaginable struggles. What she finds inspiring is that they still find the joy in life and continue to fight. She also gave credit to her mom for inspiring her and showing her what it means to be lovely. By example her mother taught her what it means to just be yourself and to embrace who you are. Clearly, Renae is a warrior and I am proud to have met her. Instead of a giveaway, I urge you to take what you have read here and give back. Renae isn’t far from her goal for the climb. Read through her fundraiser page and learn more about her story. She is inspiring and lovely in every sense of the word. What a wonderful post, Jana. I'm so inspired by Renae and will be praying and thinking of her! Oh Jana!!! Thank you so much for this gift, I had no idea that you were going to offer a different prize! This was the best one for me, thank you for allowing me to shine a light on my lovely friend Renae. It means more to me than you know. :) I hope other people read about her and her story and feel inspired. Cancer is tough but the human spirit is tougher. Thank you for highlighting Renae's perspective and positive attitude on such a difficult thing to face. I will be praying for her too!